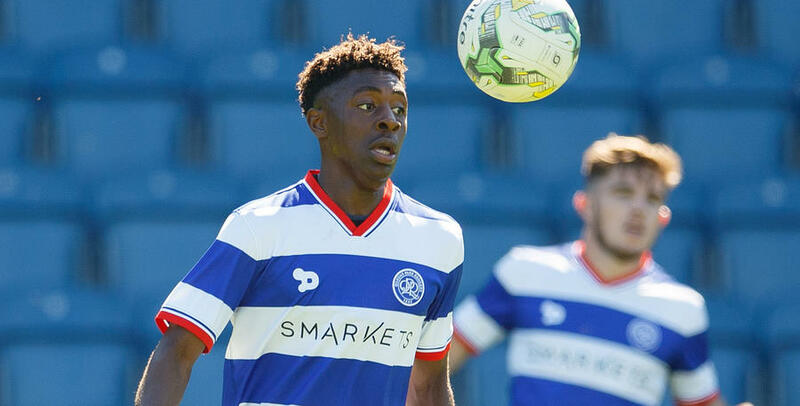 QPR’s Under-23 side came out winners in a thrilling five goal encounter at Loftus Road on Friday afternoon. The R’s went ahead when Alex Finney was adjudged to have been brought down by Colchester Captain Dexter Peter and Eberechi Eze coolly tucked away the penalty. Just before half-time Colchester equalised through Decarrey Regis before Rangers went ahead again when Eze’s penalty was saved but substitute Gianni Critchlow was on hand to tuck away the rebound. The U’s thought they had earned a draw when Eoin McKeown capitalised on a defensive mix-up in the 82nd minute but right at the death Critchlow’s low effort saw Rangers take all three points. Colchester started the brighter out of both teams and in the second minute Tariq Issa tested Rangers keeper Dieng with a free-kick and then a low shot after Alex Finney failed to cleared his lines. Rangers slowly began to grow into the game and a wonderful defence splitting ball from Niko Hamalainen led to a shot from Ody Alfa, which was deflected just wide. However it was Colchester who should have taken the lead when the full-back Ocran put in an accurate cross only for Louis Dunne to shoot over. The game was beginning to open up and it was Rangers who next went close when a lovely pass from Manning found Prohouly in the box but he was denied by a great save from James Bransgrove. Moments later the R’s took the lead when the referee penalised Dexter Peter for holding onto Finney’s shirt and Eze slotted in from 12 yards. After controlling the rest of the half Rangers were dealt a sucker blow on the 43rd minute when a quick Colchester free-kick saw the ball break to Sheriff. His initial shot was saved but he managed to score on the second attempt despite Chris Paul’s best effort on the line. QPR had the perfect opportunity to restore the lead after the break when Ody Alfa was brought down in the box following a great turn and run. This time Ryan Manning stepped up but his penalty came crashing off the bar. The Irishman then retrieved the ball and cutely chipped the keeper from just inside the box but remarkably it once again came back off the woodwork and the scores remained level. In the 60th minute Rangers were awarded their third penalty of the match when Hamalainen had his shirt pulled back by Sembie-Ferris. Eze this time grabbed the ball but his penalty was well saved however substitute Gianni Critchlow tapped home the rebound. Rangers looked to have weathered a mini storm from Colchester but in the 82nd minute a looping ball caught out both centre-halves and Colchester’s Eoin Mckeown expertly finished to level the scores. But the drama was not done. With one minute left on the clock Josh Bowler picked out Gianni Critchlow and the youngster showed great composure to find the bottom corner to give the Hoops a well earned three points. QPR U23s: Dieng, Kakay, Hamalainen (Arthur 69), Manning, Paul, Finney, Bowler, Akinola, Alfa (Crichlow 54), Eze, Prohouly. Subs not used: Herdman, Klass.